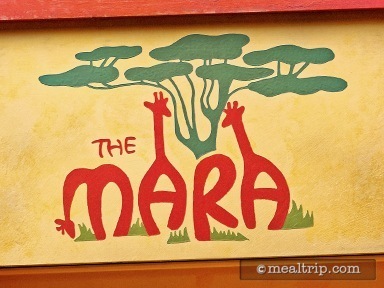 The Mara is the Animal Kingdom Resort's only counter-service eatery, and is located near the Jambo House pool. The Mara river (for which the restaurant is named after) flows through Keny and Tanzania. The design cues in the restaurant attempt to mimic a savanna-like space with tree, water, and river stone flooring treatments. As nice as the space is, the first thing that people notice is just how low the ceilings appear to be. We're not sure if it's an optical illusion, or if they're less tall that other areas. The dining area itself is medium sized (compared to some of the counter service locations at the resorts), and I have to say, being so close to the pool area… there are quite a few pool clad guests running around inside. More than what the well-designed space might suggest when entering. There are enough similarities in the lunch and dinner menus for us to consider it an all-day menu. There tend to be a few sandwiches at lunch that are not on the dinner menu, and most of the hot plated dinner items that are not on the lunch menu. Soups, seem to be available all day, along with a great African Stew, along are some of the more American fast-food type items, including hot dogs, cheeseburgers, and flatbreads (although, the flatbreads do include some African, Indian, and Mediterranean inspired toppings). The lunch menu also features a couple of hand carved Turkey, Ham, or Corned Beef Sandwiches and a couple of pitas. The dinner menu features a few more plated items such as an Oak-smoked Rotisserie Chicken, Seafood Gumbo, Ribs, Salmon, and a Lamb Stew. The Mara is the only counter service location for both the Jambo House and Kidani Village at Disney's Animal Kingdom Lodge. That always seemed a little odd to me, because those poor guests staying on the north west end at Kidani have a loooong way to casually walk over and grab something to eat. Sure, they have Sanaa right there, but it might be nice to have another counter service location on the Kidani side. I'm just saying. It's interesting that I brought up Sanaa as well... because the two restaurants both make use of a custom-shaped, floating drop-ceiling effect to give guests the feeling that we're dining under a canopy of trees. Sanaa's compartmentalized dining areas seem larger because of it, while the actually large space at the Mara seems closed in and a little claustrophobic as a result. It's very interesting, (to me anyway), and I'm sure there's a lesson to be learned about interior design in there somewhere. Beyond that, the two restaurants are very different. That's not entirely bad though. For a counter service location, The Mara may be one of my favorite counter service locations (from a food standpoint), because like most of the restaurants at Animal Kingdom Lodge, they offer what are basically American dishes, with African, Indian, and Mediterranean spices added here and there. It's a perfect mix for those that want to experience cuisines outside of what one can get just about everywhere else. A perfect example is the Mara's African Stew that I had a chance to try the other day. Most westerners are familiar with a meat, potatoes, and carrots kind of stew, or if you're from a barbecue state... a more spice heavy Brunswick stew that usually has pulled pork, chicken, corn, and a bit of heat to it. 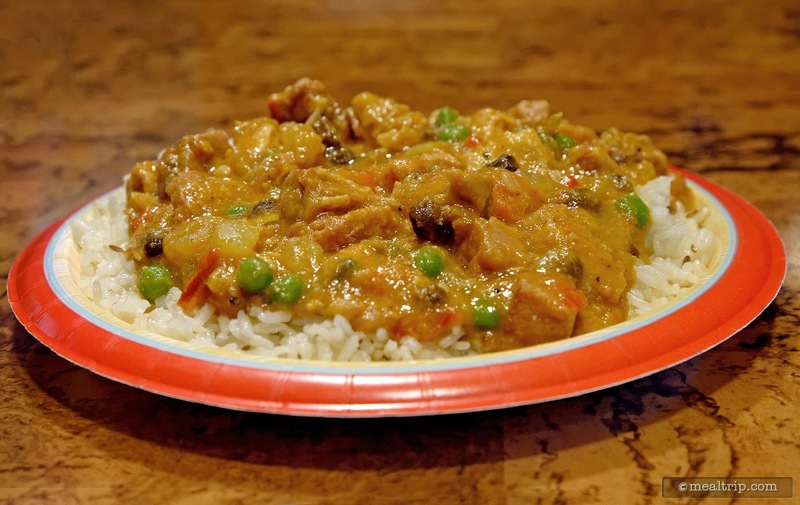 The Mara's African Stew really is a sum of it's parts, combining beef, turkey, ham, carrots, potatoes, peas, chickpeas, and raisins, all served over Basmati (white) rice. Yahoo for raisins, and not Craisins®. Don't get me wrong, I love a good Craisin® but they're all over the place these days. The not as sweet raisin makes much more culinary sense in this dish. One of the spice component is a bit of red curry, but not to the point where there's any real spice-heat to the dish (it's very far back in the sauce), and of course a few of the trade spices, coriander, garlic, and probably a bit of dried pepper of one type or another. The reason that it doesn't come off as a super hot (spicy) dish, is because there is also coconut milk and sugar in the mix. All in all, it's not like any stew you've had before... and as a foodie, I love having options and getting flavors that you just can't find anywhere else. 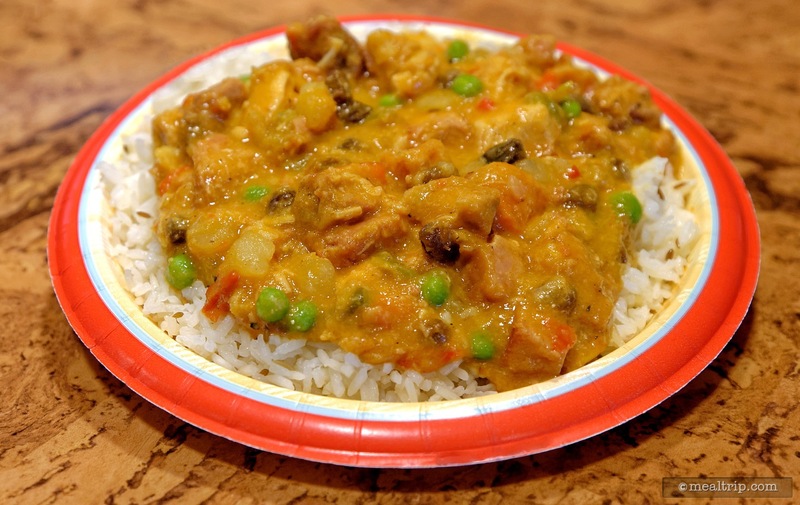 This particular stew might be what I would consider a good "baseline" for many of the savory foods at Animal Kingdom Lodge... the combination of curry, pepper, coriander, and something sweet to balance it all out... is a theme that you'll find in many of the dishes here. About the only downside for me at the Mara, is the pesky location. It's just so darn close to the pool that you'll find more scantily clad, wrapped in a towel, slightly wet guests squishing around in flip-flops (if you're lucky), and I've even seen a few bare feet... as if the Mara were a pool bar. I get it… it's a resort, you're on vacation… the Mara is right there, it sort of looks like it's a giant pool bar. I'm just saying… dry off first… you're going to catch a cold going right from the pool into the air-conditioning!